This is a great way to change up your summer grilling. 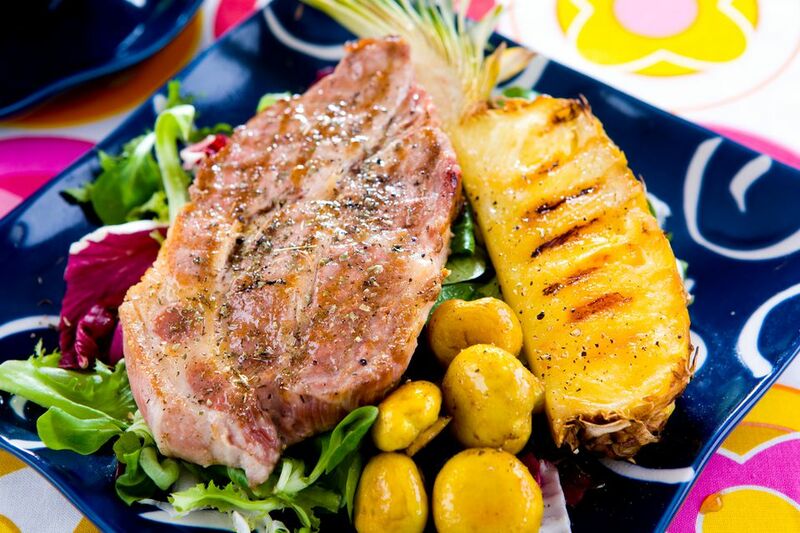 A ham steak gets paired with pineapple, mustard, and honey, which gives it a delicious flavor. You can probably get the pineapple juice for this recipe from the whole pineapple after you have cut it up. However, if you're pressed for time, simply use canned pineapple juice. Mix together the pineapple juice, oil, and 1 teaspoon/5 milliliters of the mustard. Make cuts through the fat on the ham steak so it won't curl while on the grill. Place the ham in a shallow glass baking dish and pour half of the pineapple mixture over the top, reserving the other half for later. Cover with plastic wrap and let stand at room temperature for 20 to 30 minutes. With a pair of scissors, trim the sharp points from the pineapple crown. Clip off any dried spikes with kitchen shears. With a sharp knife, cut the pineapple lengthwise into 8 equal pieces. Lay them out on a platter, skin down, and drizzle with honey right before placing onto the grill (you might need more than 2 tablespoons/30 milliliters). Place the ham on the grill over a medium fire. Let grill for about 10 to15 minutes, brushing periodically with marinade. Remember that it is safe to use the marinade as a baste, since the ham is fully cooked. When browned on one side, turn over. Place the pineapple pieces on the grill. Continue grilling, brushing the ham with the marinade from time to time. Remove when the pineapple has good grill marks and the ham is heated through. Place on serving platter. Warm the remaining marinade in a microwave or on the stove top and mix with remaining mustard until the mustard is evenly dissolved into the mixture. Pour over ham and serve.